The Metrologic IS3480 QuantumE omni-directional and single-line scanner is designed for integration with a variety of applications including interactive kiosks, price lookup systems, ATM's, reverse vending machines, controlled access, or a host of other devices. The IS3480 QuantumE's main cable connector is located at the top of the unit to facilitate mounting and the auxiliary connector gives users access to several of the I/O signals, providing the flexibility for external hookup of the beeper, button, and LEDs. Products and parts from Code. MS2320 StratosH is Honeywell's 6-sided 360 degree high performance bioptic scanner/scale series well suited for POS applications supporting narrow enclosures around the vertical tower. MS2320 StratosH is designed to allow easy integration into most of today's seated and standing checkout environments. MS2320 StratosH features a powered RS232 auxiliary port for integration of a handheld barcode scanner, flash ROM firmware upgrade capability, MetroSet2 PC-based configuring and sapphire or diamonex based horizontal glass. MS2320 StratosH is Metrologic's 6-sided 360 degree high performance bioptic scanner/scale series well suited for POS applications supporting narrow enclosures around the vertical tower. MS2320 StratosH is designed to allow easy integration into most of today's seated and standing checkout environments. MS2320 StratosH features a powered RS232 auxiliary port for integration of a handheld barcode scanner, flash ROM firmware upgrade capability, MetroSet2 PC-based configuring and sapphire or diamonex based horizontal glass. Honeywell's new Xenon Performance XP 1950g provides superior scanning even on damaged and poor-quality barcodes, eliminating wasted seconds from every transaction. Optimized for scanning both digital codes off customer smartphones and merchandise codes by the cashier at the register. Available in black or white models to match the scanner to your environment. The GM4500 is the latest in Datalogic's popular Gryphon series of scanners. The 2D wireless scanners were designed for general purpose applications and are the first to have the innovative contactless, wireless charging system. 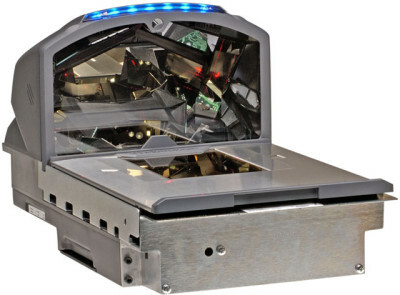 The omnidirectional imager allows for snappy scanning on all common 1D and 2D barcodes. Designed with Datalogic's patented Green Spot technology and vibration for superior good-read technology.